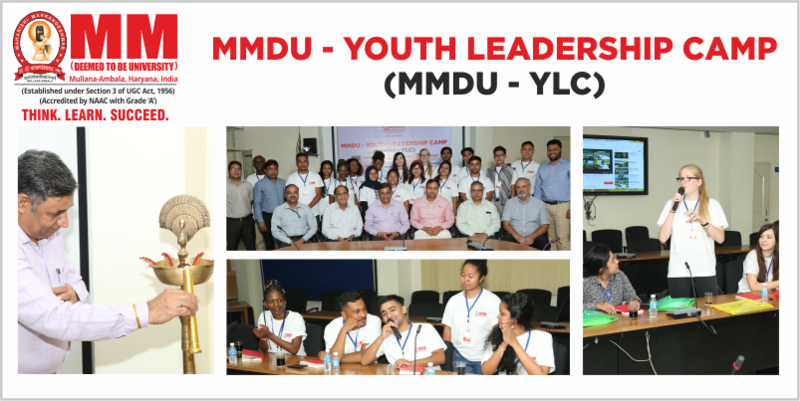 MM (Deemed to be University) inaugurated 6-day Youth Leadership Camp at the campus today where young leaders from 10+ countries, including Germany, Hong Kong, Nepal, Bangladesh, and Sri Lanka have participated. The event commenced with the lighting of lamp and then addressed by the University associates. The highlights of the event was the interactive sessions on topics like Power of Habits, SWOT Analysis, and Decision Making, etc. Youth Leadership Camp has been successful to establish a success story as it started with the participation of students from few countries and now marked participation from 13 countries. A photo session was also arranged for the young leaders to take along great memories of the Youth Leadership Camp with them. At the end, a fun game session was organized for the students which was accomplished with great enthusiasm. A day before the inauguration, a cultural dance was also presented by the students of MMDU to make young leaders get familiar with the culture of Haryana. Young leaders also participated in the dance event with great zest and zeal. When asked from one of the young leaders about the event he shared: “I am happy to be a part of this event. It is indeed a great experience for me. The all I want to say that the event is organized in an excellent manner in every aspect”. Stay tuned to get more on Youth Leadership Camp 2018! Admiring the persistence you put into your blog and detailed information you offer. Wonderful article! That is the kind of info that should be shared around the net. Great post. I am impressed!